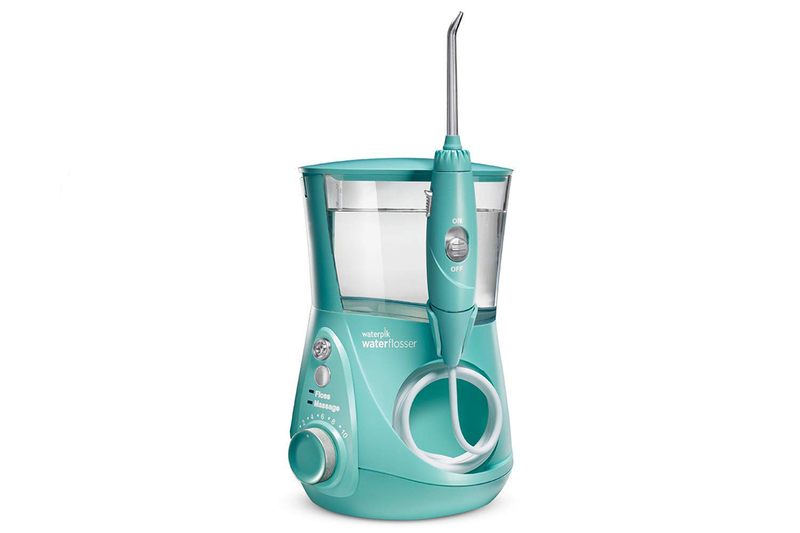 The Waterpik ADA Accepted WP-662 Aquarius Water Flosser is honestly life-changing. Hate the idea of flossing? Prepare to love it. Yes, we said “love” and we meant it. We feel like total floss bosses and we want the world to know. If you notice Us flashing a bright smile more often lately, this is the reason. 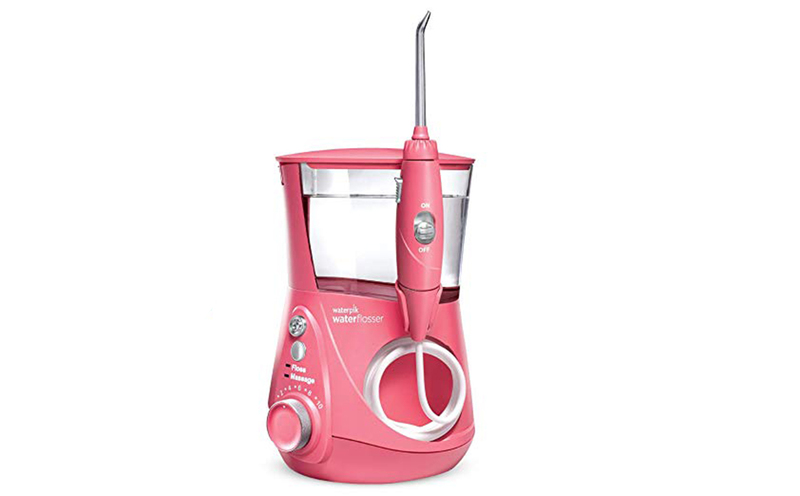 See It: Check out the Waterpik ADA Accepted WP-662 Aquarius Water Flosser (originally $90) now starting at $53 on Amazon with coupon applied at checkout! Please note, prices are accurate at the date of publication, January 20, 2019 but are subject to change. This Waterpik water flosser is super easy to use, so we were shocked to see how many settings it has. Let’s talk numbers. This flosser has 10 pressure settings! For all of us first-time water flossers out there, this means we can build up to higher-pressure settings with ease. Or we can keep it low to accommodate gum sensitivity! It’s every individual user’s choice. That’s not the end to the customization of our flossing experience. This flosser also comes with seven flossing tips: three Classic Jet Tips for general use, one Plaque Seeker Tip to remove nasty plaque, one Pik Pocket Tip for peridontal pockets, one Orthodontic Tip for braces and one Toothbrush Tip for manual brushing while flossing. That’s not the end of our custom flossing experience either! The Aquarius Water Flosser also has two modes: Floss Mode for maximum plaque removal, and Hydro-Pulse Massage Mode for enhanced gum stimulation and improved circulation. We’re pretty sure our string floss never did all of that. Not to worry about damaging dental implants either. This flosser is up to two times as effective for improving gum health around implants as regular floss! While this flosser comes with seven tips, we have one of our own: Make sure the tip is in your mouth before turning the device on unless you’re trying to floss and wash your face at the same time! If we’re not all dentists, it can be hard to know exactly how long we should be flossing for. Surprise! This water flosser takes care of that too. It has a one-minute timer and a 30-second pacer so we don’t under or over-floss each part of our mouth. And when we’re all done, there’s in-unit storage to keep our tips protected from dust and dirt until next time. Since this water flosser has thousands and thousands of reviews, we had to see what was capturing so many shoppers’ hearts and mouths! Waterpik guarantees that its users will see up to 50% improvement two weeks after switching over from string floss, but some shoppers are reporting even faster results. One said they had used it for just five nights when they saw and felt a noticeable change. Others shared the same sentiment, saying they “should have bought this years ago” and that they “couldn’t be happier.” If we’re happy, we’re smiling, so we might as well show off our enviable oral health! Flossing can seem so boring and basic, but with seven colors available, this product is anything but! Whether we’re picking a color to match our bathrooms or just our personalities, we’re having fun with this. For a monochrome look, black, white and modern gray shades are available and are ultra sleek. Want to add a little color to your routine? The blue shade is a nice navy that makes the white detailing pop. More color? Sure. Orchid is a pretty purple while pink is a bright coral, flamingo-like shade with chrome features. Also with chrome features is the last color, which is a trendy teal. This almost-minty color shouts “clean” to Us. We’re big fans of good oral hygiene but admittedly have never loved the process of achieving it. That’s why we’re so happy with this water flosser. And we know it’s not just Us. It was awarded the American Dental Association Seal of Acceptance, so the professionals are big fans too. Does this mean we can skip our biannual cleaning? We probably shouldn’t. Actually, we’re kind of looking forward to how impressed our dentists will be when they see our teeth! See It: Check out the Waterpik ADA Accepted WP-662 Aquarius Water Flosser (originally $90) now starting at $53 on Amazon with coupon applied at checkout! Not into it? Check out these beauty deals on Amazon instead! Please note, prices are accurate at the date of publication, January 20, 2019 but are subject to change.